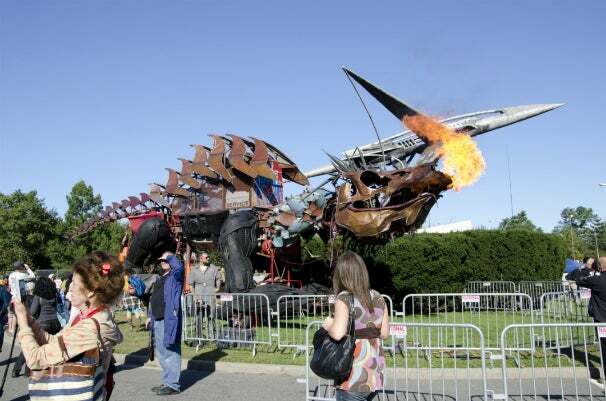 Last weekend, New Yorkers were graced with the awesomeness that is Maker Faire. This year there were more than double the people in attendance as compared to last year, a smogasbord of food, tons of booths to puruse, and a whole load of Arduino boards and parts. Here are just a few things that were cool, techy, and a little wacky. A little while back, DARPA put out a call for UAV designs submissions for a $100,000 reward. UAV forge, the community project where all the designers can collaborate, brought one of its most-complete projects, the Shrike. 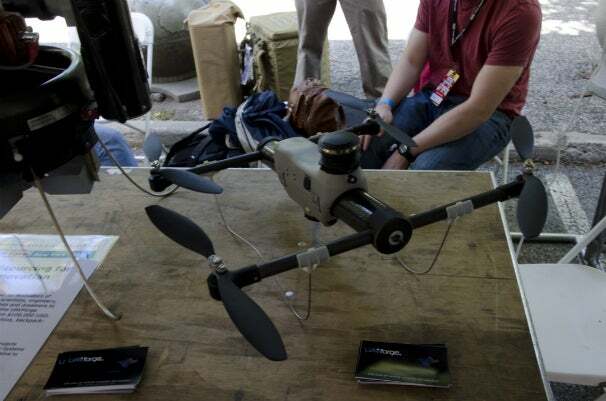 The Shrike, which is in its second generation of development, is a multi-rotor UAV similar to the AR.Drone Parrot. The Shrike flies using its four rotor blades that let it turn on a dime and hover in place even 15-knot winds (about 17 mph). The UAV is powered by a lithium fuel cell system that also serves as the aircraft’s fuselage. The Shrike can fly continuously for just under an hour, but unlike the Wasp (the portable fixed-wing UAV used by the military), the Shrike can go into a hibernation mode for a week, reactivate, and take flight again all on its own. The Shrike’s platform is completely modular it can be equipped with a 300-gram payload that could be a 360-degree camera or an infrared camera, for example. Military uses aside, UAV Forge has been talking to Google, which may have some interest in deploying UAVs to capture Google Earth images. We’ve all seen the call for medical supplies for third-world countries, but what happens when the latest high-tech EKG-machine actually gets there? In most cases, it eventually breaks down because the equipment is not ruggedized. So now doctors are looking for cheaper, readily sourced, and modifiable equipment for use in the field. Jose Gomez-Marquez, Program Director for MIT’s Innovations in International Health, held a presentation to highlight such equipment. At right is a delivery system for asthma medication that employs a simple bicycle tire pump in place of an electric powered air pump. The system is scaled down version of Gomez’s own invention the Aerovax, a backpack-worn inhalable vaccine delivery system. The device was inspired from another doctor who used a crop duster--the planes used to spray pesticide over farmland--to treat an entire village, and it totally worked! On top of making more versatile equipment, these doctors seek to find ways to repurpose any materials they might have lying around. One doctor used a toy helicopter to stir a ground-up pill for their patient to inhale. Even the patients have gotten into making improvised medical equipment--one woman from a village fashioned a stethoscope from a bike inner tube. 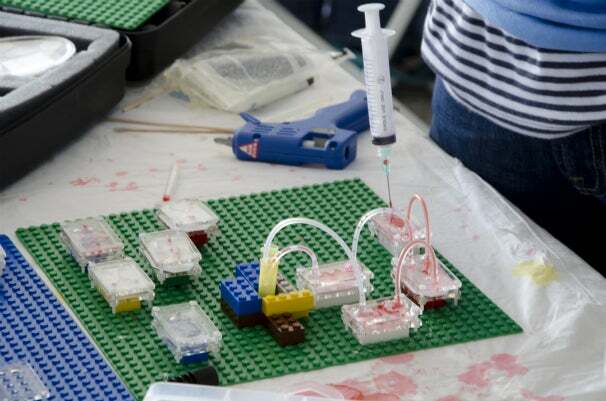 Doctors are given Medikits containing basic parts that they can use to build things like this diagnostic setup anchored to a Lego board. Normally a hospital would sterilize their tools in a chamber heated and pressurized by a steam pipe, but that’s not possible in village where there's no plumbing. So the doctors assembled a solar autoclave chamber out of cardboard that is heated by the Sun's rays. On the grander scale, doctors are trying to correct medical behaviors. Reuse of syringes has led to the spread of HIV and other diseases. So one idea is to disable them after it’s first use by installing a zip tie or inserting a pipe-cleaner-like material that catches the plunger. And patients who would have previously taken only part of their medicine are now given cellphones that send reminders while they get free minutes as a reward-incentive program. TVs with apps are nice and all, but what if you bought your HDTV before so-called smart TVs hit the market? Chumby’s latest venture, called NeTV, looks to bring web functionality to any TV, game console, DVR, or media center PC. The device can overlay a Twitter or Facebook stream, weather information, sports scores, SMS or email messages, or a Web browser over just about any HD stream. You can control it all from an Android phone--iOS support is in the works. Andrew "bunnie" Huang, Vice President of Hardware Engineering and Founder of Chumby, showed off its capabilities by uploading a picture to Twitter and having it display on the screen seconds later. Huang also typed in Web address on his phone so that the page came up on the TV; scrolling on his phone scrolled the page on the TV as well. The unit itself is running a Linux OS on an 800MHz Marvel processor. 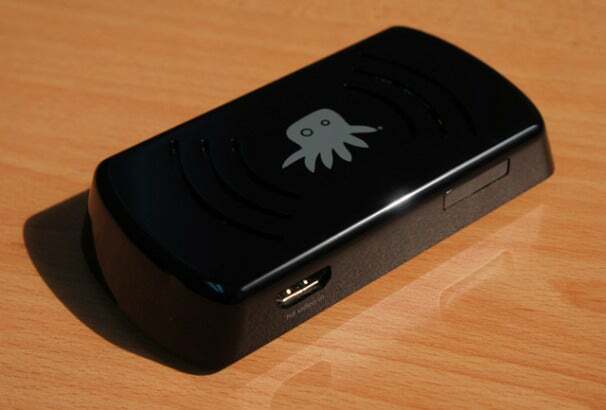 The device connects via Wi-Fi and supports 480p, 720p, and 1080p resolution video. Developers will be able to get their hands on NeTV later this month, but if you are salivating about writing your own apps for it, Chumby has the specs and software online for your reading enjoyment. There’s nothing like watching 250 computer-choreographed singing and dancing lobsters, trout, and bass. The Sashimi Tabernacle Choir, also known as the Singing Fish Art Car, is a project started by Richard Carter and John Schroeter, along with a team of 30-something volunteers, back in the early months of 2001. The 250 anamophic robotic singing sea creatures were attached to the outside of a circa-1980s Volvo to take part in the Houston Art Car Parade. Each Billy Bass and Dancing Larry Lobster was taken off its original plaques and had its components replaced with new servos. All the singing robots are connected to a computer controller in the back that uses over 5 miles of wires. The car is equipped with a full choir, a male and female soloist Billy Bass Superstar on rising platforms, and the conductor ("The Lobster Formerly Known As Larry”) at the front on an extending arm.